Back to regular broadcasting as we are nearing the end of the week. It’s been quite the busy week for me with more appointments for getting stuff done with the house and the wedding. For those of you that care in the least bit, I’m happy to say that Diana and I have finally sealed the deal on a venue for next year. That was the most stressful part of the “wedding planning” stage so far because if we didn’t lock in a venue, the wedding wasn’t going to happen. After that, everything usually falls into place with some coordinating here and there. Next up are save the date cards and that should be it until it gets closer to the day. Anyways – enough of my life story for now – the time has come for Hoang’s Civic! I was super pumped to finally shoot it and now I’m super pumped to post the pics. I’ve been wanting to shoot it ever since I met Hoang and his Civic in 2010 during Driven when he entered with illmotion. 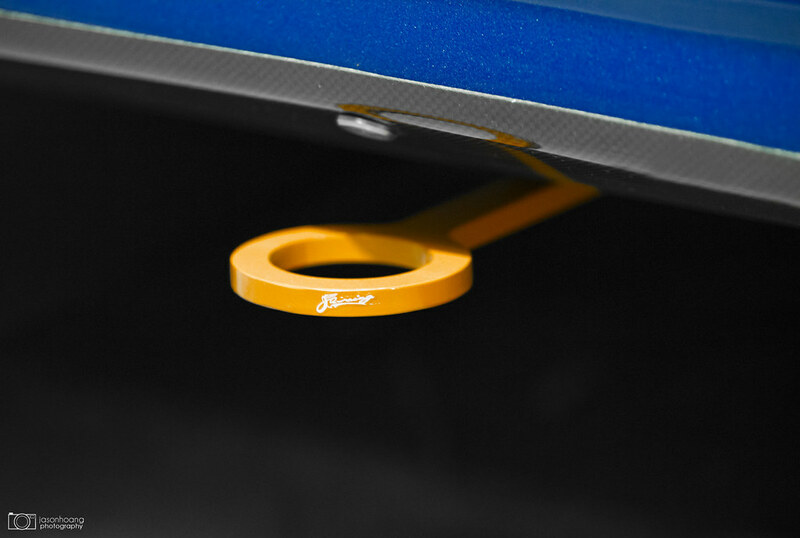 The most attractive feature of Hoang’s car for me was the J’s Racing GT wing. It was the first EK coupe that I’ve seen with a GT wing and I had, and always will have a soft spot in my heart for J’s Racing parts. His car was on Mugen MF10’s and it was just so mint. 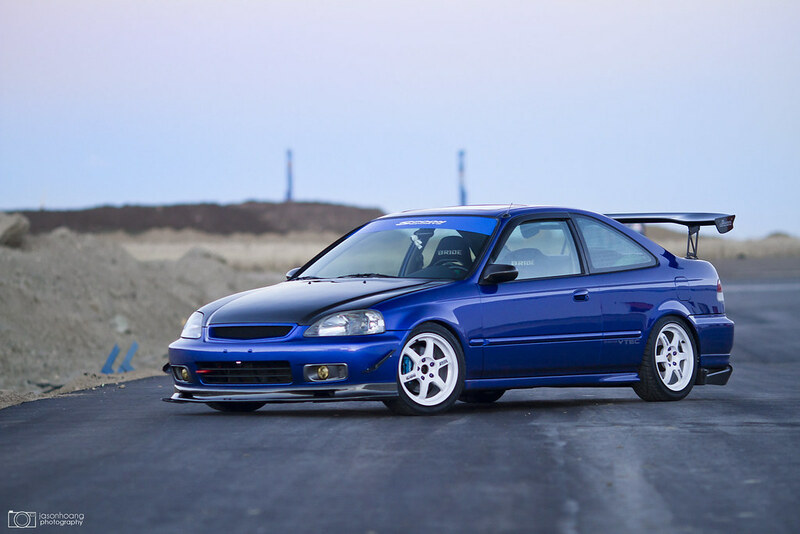 Many of the EK coupes that I see are usually done up in a very simplistic way – much like Brad’s Civic and it just works well that way. However, when you turn the tables a full 180 to an aggressive track-inspired look, it looks equally as good and Hoang’s is exactly that. Here is a shot of his car that I took during that show from 2010. You’ll see that not much has changed besides his wheels. It’s also been 3 years since this shot and the car has not aged one day. On route to our location. Looking aggressive from the front. 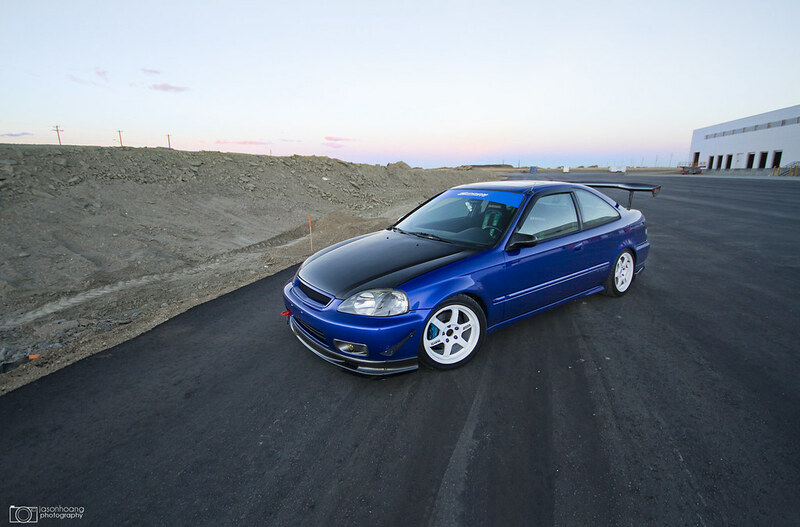 Hoang’s EK looked perfect rolling in the sunset. The blue was just perfectly match with the sky. Now you can see why I said it’s track-inspired theme looks so good. There are a bunch of retrofitted parts on Hoang’s Civic that make it unique. If memory serves me right, the carbon canards and lip additions are from an M3 body kit and fitted on. Another shot with the awesome lighting. It was cold as hell that day though. 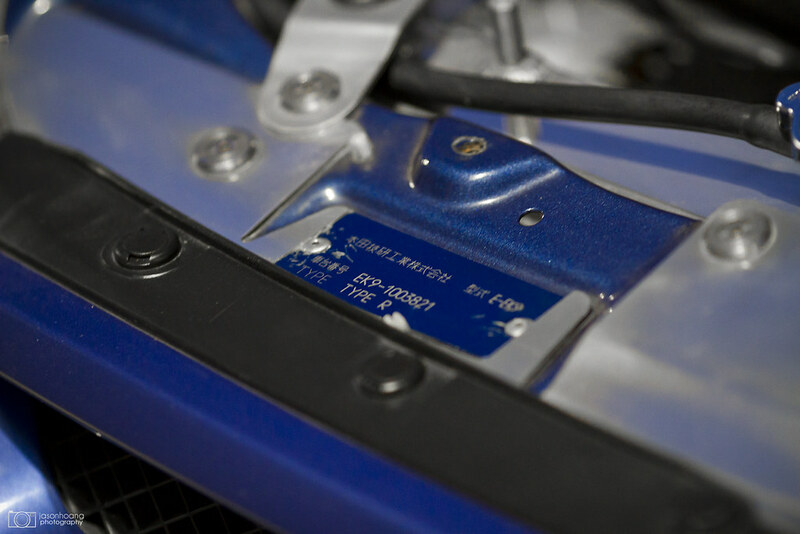 Front quarter shot – shows the aggressiveness that the J’s Racing wing adds. Like I mentioned before – I love that these guys are coming out to let me shoot because they really just spend a lot of their lives in the garage so you don’t see them often. Having them come out to play for a bit is even better! 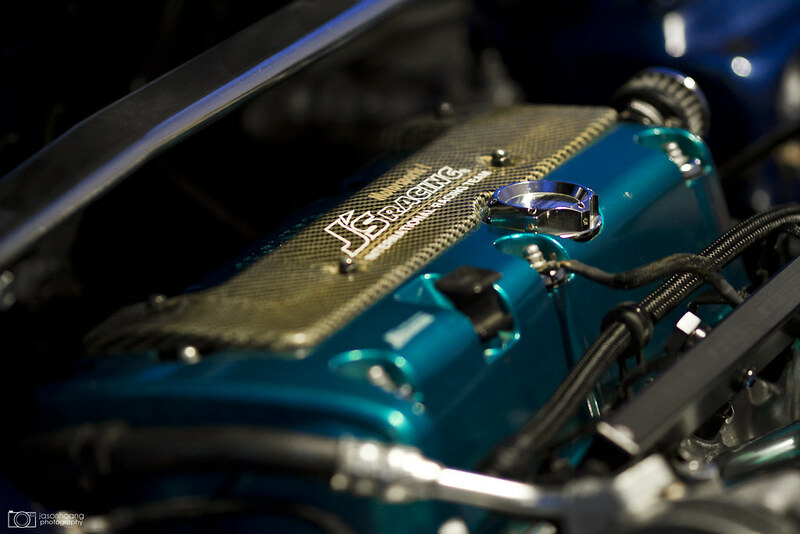 His immaculate engine bay with a lovely K20 sitting in there. Funny now that I think about it – all of the Honda’s that I’ve shot lately are either K20’s, FI K20’s, or just straight up FI. There is Hoang wiping down the bay for the shot above. Nathan and JC hang out. I felt bad because it was clean before the shoot and I had him enter a warehouse near there and it dusted up the whole car. I felt even worse when he was saying he was trying not to brake on the way to this location because he didn’t want brake dust all over his wheels. 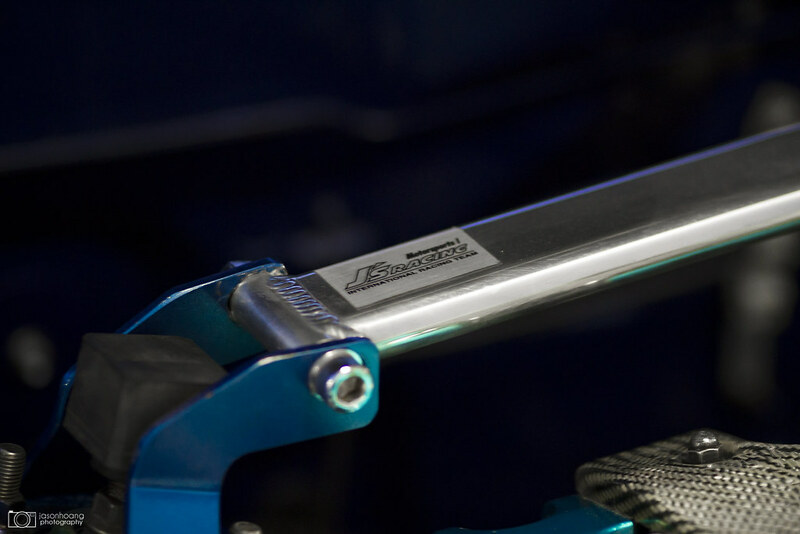 The signature J’s Racing teal valve cover. The J’s Racing wing that made me fall in love with the car the first time I saw it. Funny story behind it – when Speedtech was still open, I was talking to Jackie about his plans with his S2000 and I talked about my plans with my Civic and we eventually stumbled across the topic of GT wings. 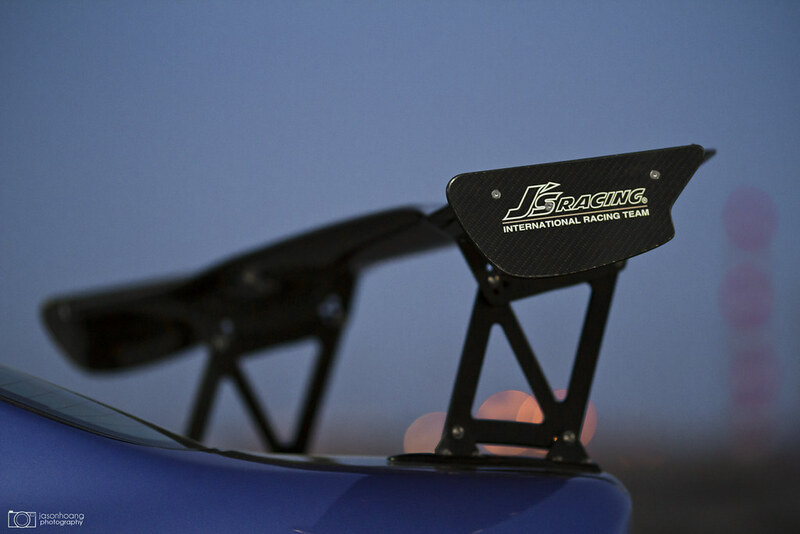 Jackie’s S2000 was sporting the 1700mm wing he still has today and I was saying how much I loved it and wanted one – not knowing I would have soon traded my TE37’s for his brother, Dal’s J’s Racing wing. Jackie said he had a smaller J’s Racing wing before that and ended up selling to his buddy with an EK. He showed me a pic and unbeknownst to me, it was Hoang’s. And so, here it is today. Still in pristine condition and one of the only EK coupes that I’ve seen with a GT wing without looking gaudy. 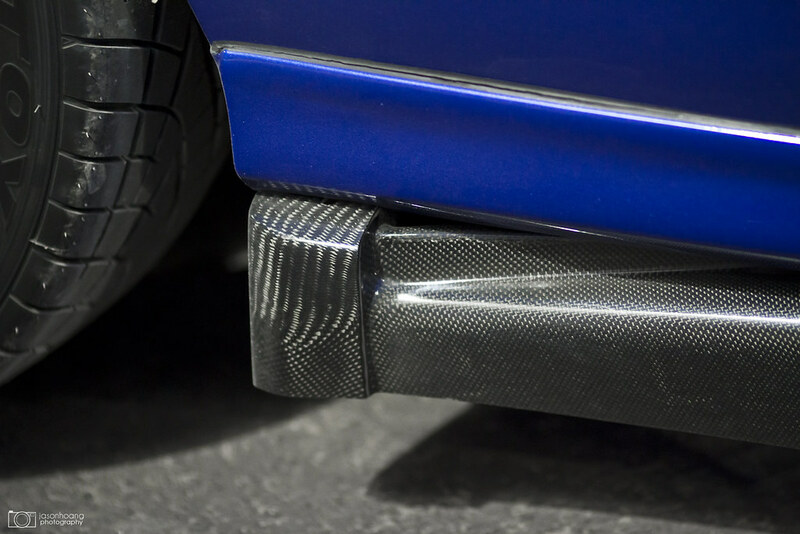 The end that Hoang cut is now covered with another carbon “cup” to hide it up and give it a more polished and finished look. 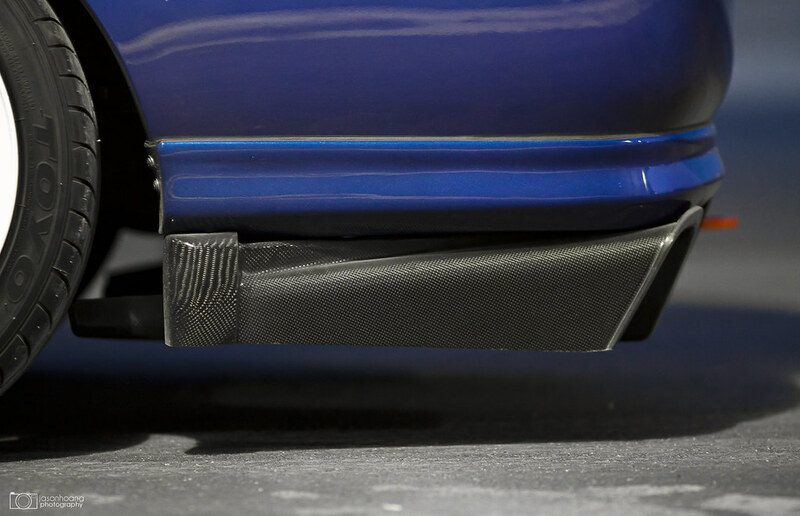 That “cup” is actually also from an M3 carbon lip that he also cut and fitted to the diffuser. I, too would also rather cut an M3 lip to make a Spoon diffuser look better. It’s hard to see but if you could touch the seam, it is smooth as butter. It’s almost like it was molded on or was an additional piece that Spoon provided if you wanted to use it or something. Great job to Hoang for that. Wheel/brake set up upclose. 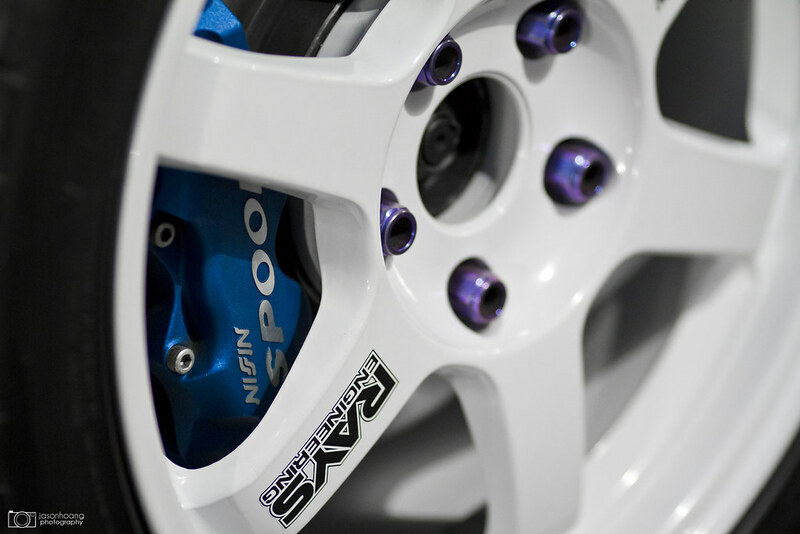 Volk TE37’s paired with twinblock Spoon brakes. Again, if you’re a diehard detail fan – you’ll notice the full titanium T1R lugnuts. You’ll also know they aren’t cheap at all lol. 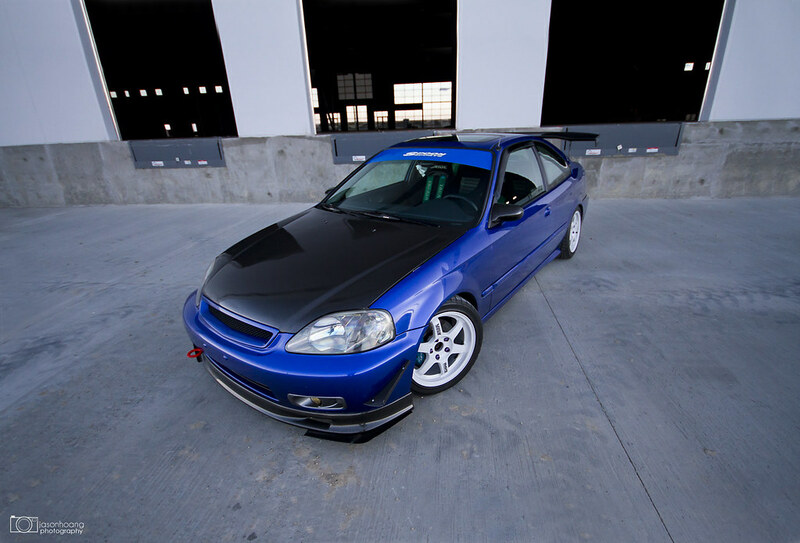 Paying more attention to detail, he’s got J’s Racing tow hooks up front and out back and if you’re really scrutinizing this pic – you’ll see he used a Mugen bolt to hold the diffuser to the body… Love it. 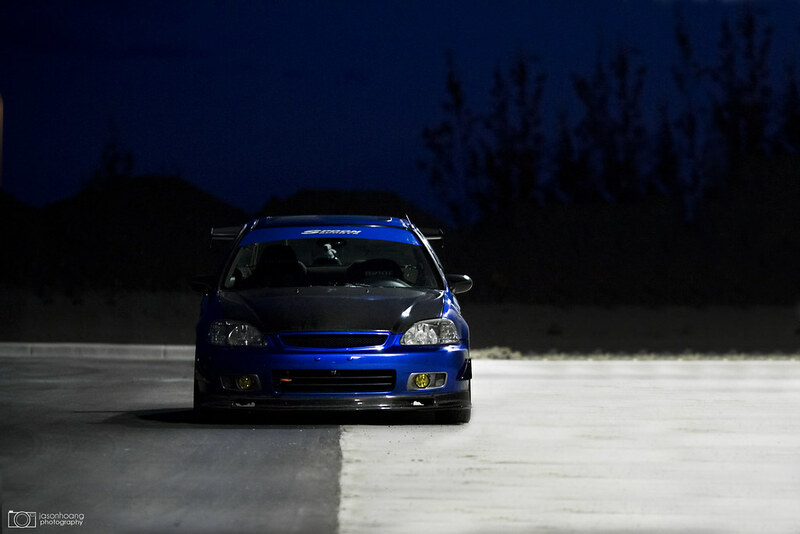 One of the shots I posted on Facebook from the night I shot his car. And from the back. I feel like the Spoon diffuser is a perfect addition to the wing now. At Driven, it didn’t have the diffuser and it looked a bit naked, but still awesome. And to end it off, I always like to finish with another roller. 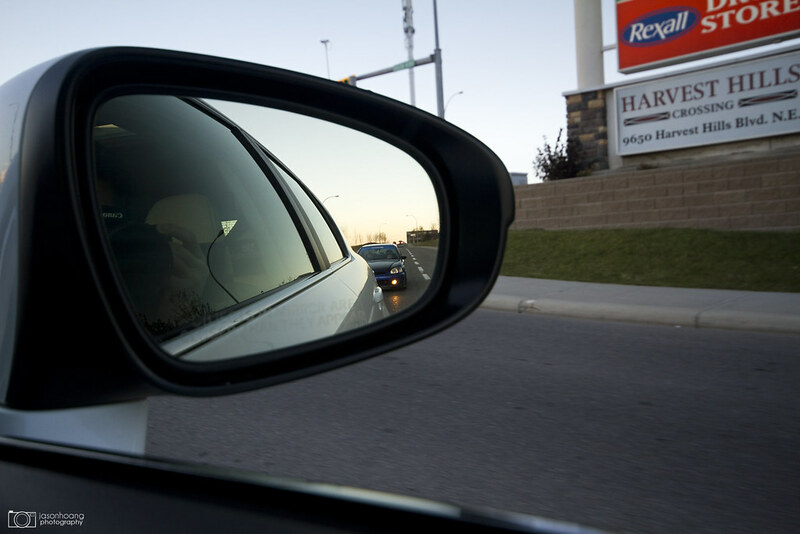 I absolutely loved this shoot, not just because of the car but because Hoang is really one down-to-earth dude. Extremely humble and easy-going – it’s hard not to appreciate him and the work he’s done on his car. Thanks to Nathan for helping set this one up as well and once again to JC for being my chauffeur for the last few shoots because I’m lazy as F.
Sad to say that another one is in the bag. I’ve retired for the year from shoots because it’s getting super chilly now and the sun goes down faster than we can shoot. Looks like it’s going to be a long winter, people… Brace yourselves. Hey Jason, is there anyway I can get the highest resolution version of these shots? I’d really like em for the purpose of having them set as wallpapers on my desktop, phone, mac, etc! If so, send them my way @ jtran5@ualberta.ca thanks! click a picture, and download original size, that’s the highest resolution I’ve uploaded since there’s no point in me uploading the highest resolution because it wouldn’t necessarily make any difference on my blog or flickr.